This page is for my information in future years, but I hope that you might find it useful too. I have always used a no-dig bed system for growing vegetables. All the beds are 1.2 metres (4 ft) wide by various lengths. This permits me to pick, plant etc. without stepping on the beds. The main advantage as far as I’m concerned is the fact that I am never intimidated by the amount of work to be done in any bed. It is a system I would recommend to anyone who wants to grow vegetables. I use porous-hose for the irrigation which will need to be daily in the hottest months. How soon I begin to use the irrigation depends on when watering by hose ‘as and when is needed’ becomes a chore. This is the second year I have grown vegetables in this garden. I will try to record how everything crops. 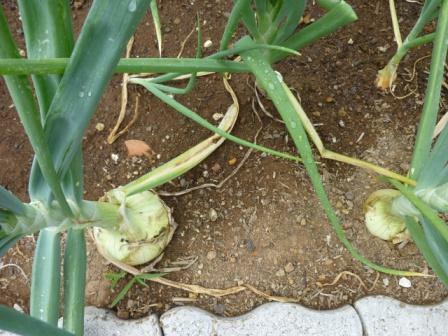 In November 2009 I planted garlic and onion sets. The garlic seem to have grown well where as I think the onions would have been better planted in February as in the UK. 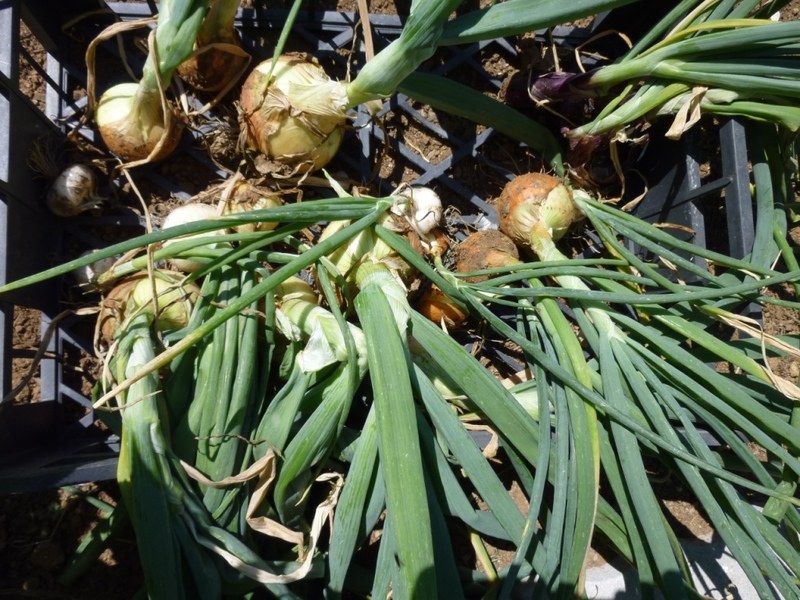 In March I added some small onion plants to fill in the gaps of the onions which had rotted; if these grow well I could just plant these next year. I also planted some broad bean plants and sowed broad bean seeds. Seeds of purple-leaved chilli (that I bought a plant of at the plant fair in Lucca last year). 1 tomato San marzano (terra di sole) for cooking – grafted which should crop earlier. 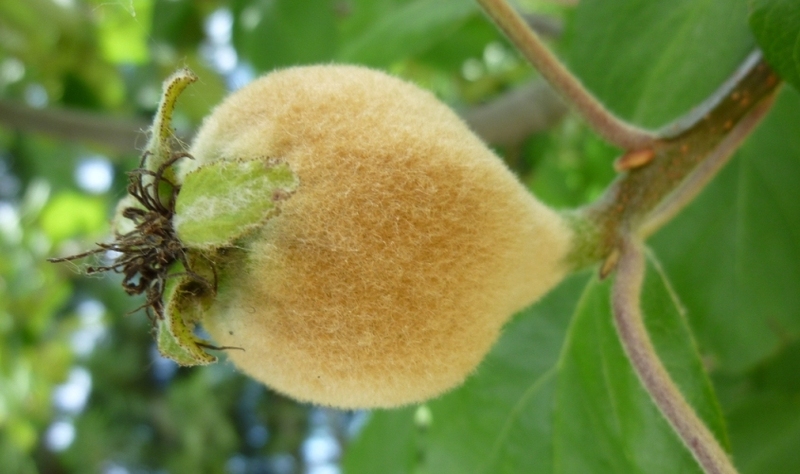 The grafted plants have lived up to their promise and have already set fruit. 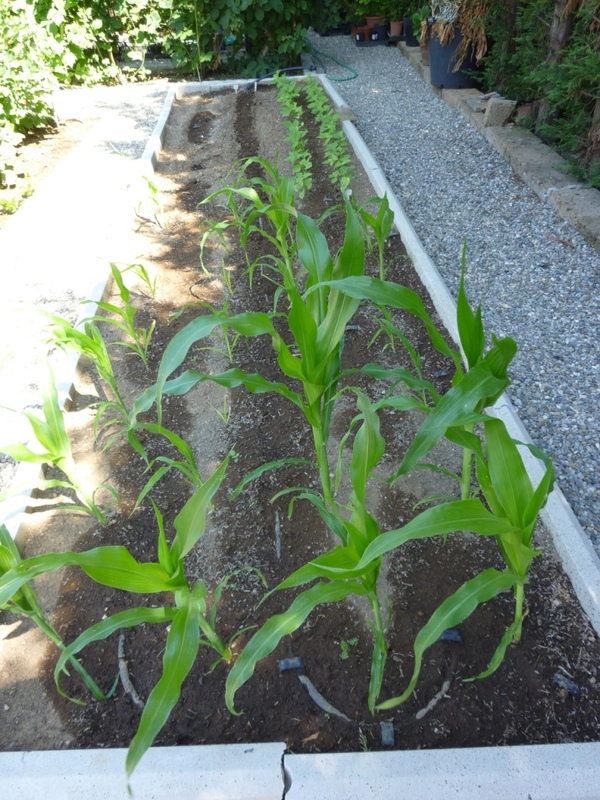 The sweetcorn seedlings have grown well so I transplanted them, by the following day they looked as if they had already doubled in size. I’ve tied the tomato plants in twice already and most of the plants now have flowers. It has been a bit cold for the zucchini, they’re growing but very reluctantly. I havested a few broad beans from the plants that had been plug plants and those I grew from seed are now as big as the ‘plugs’ ; they are setting beans and look much healthier, stronger plants than the ‘plugs’. Next year I should try some seed planted in the autumn and then another sowing, earlier than I made this year. Planted 4 x 6 different lettuce plugs. Have used most of the lettuces that I planted 17th April some had already begun to bolt. Broad beans are being cropped now; the ones I sowed caught up the plants very quickly and are better plants. I should sow some in autumn for early crop next year. 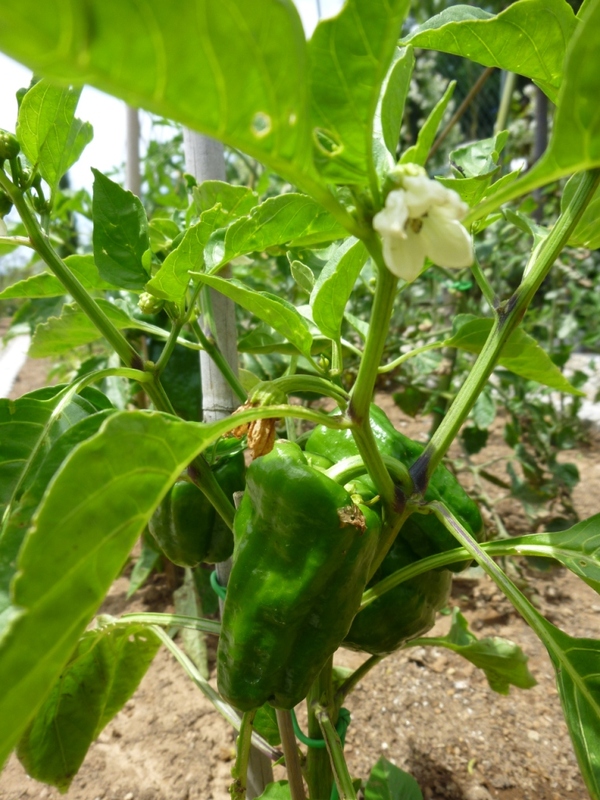 I’m impressed with the grafted pepper plants I bought; they already have fruit, as has the grafted plum tomato; other tomatoes have fruit too and are growing very quickly but the grafted plant is still way ahead. The zucchini and melons have flowers but they haven’t appreciated the cold weather. Flower to crop is usually very quick with zucchini, I’ll update when I harvest the first one. Harvested first zucchini and made spring vegetable pasta using broad beans, garlic tops and herbs from the garden and asparagus and peas bought from the farmer’s market. The dwarf beans were through in less than a week. Picked 350 g raspberries, before this there have just been a few each day to add to our breakfast cereal, though Richard did take some to work for a colleague. The first tomatoes are beginning to change colour. Tomorrow a cucumber will be ready to harvest. The onions that I planted too deep are pushing up through the soil; some have good sized bulbs. The garlic seems to be ready, I think when I can hope for a few days without rain I will lift them onto the surface of the soil to dry. I used the last lettuce planted April 17th. The peppers don’t look very different from the last photos, but I think they are growing, I just hope they become red and yellow. I have been picking lots of raspberries (see today’s post) about 300 g a day. What can I do with all these cucumbers? 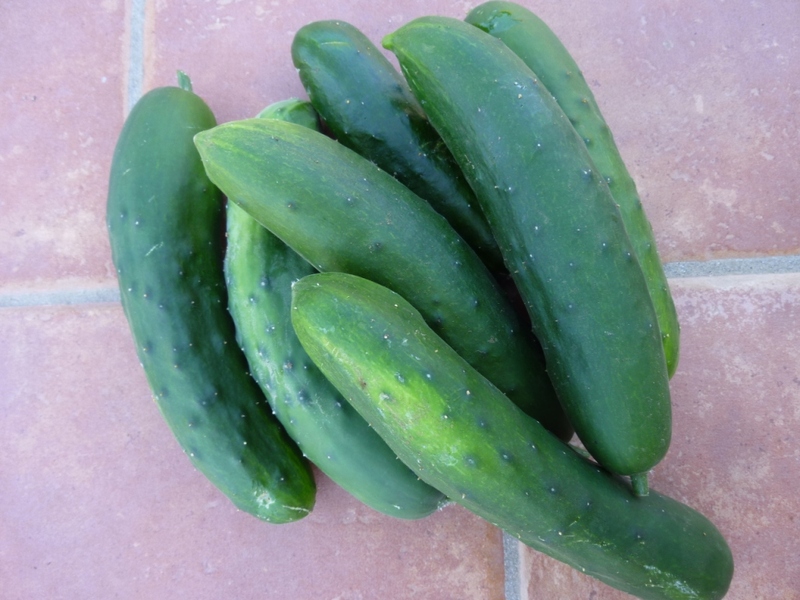 Today I also harvested 7 cucumbers from 6 plants. Any ideas of how to use so many please let me know, last year I was eating them like an apple, they are even more prolific than the zucchini. Some of the onions have now bent over signifying that they are ready to harvest. Some are very small, but this is my fault as I planted them and then added extra soil to the bed meaning that they were planted too deep. I would also plant them later, say in February or try plants instead of sets. I’ll have enough for the summer anyway. I sowed a line of purple carrots yesterday (I know its really too late). Purple because Viterbo used to be famous for purple carrots – they used to send them to the Pope – they are found here any more so I was very pleased to discover these in the UK. 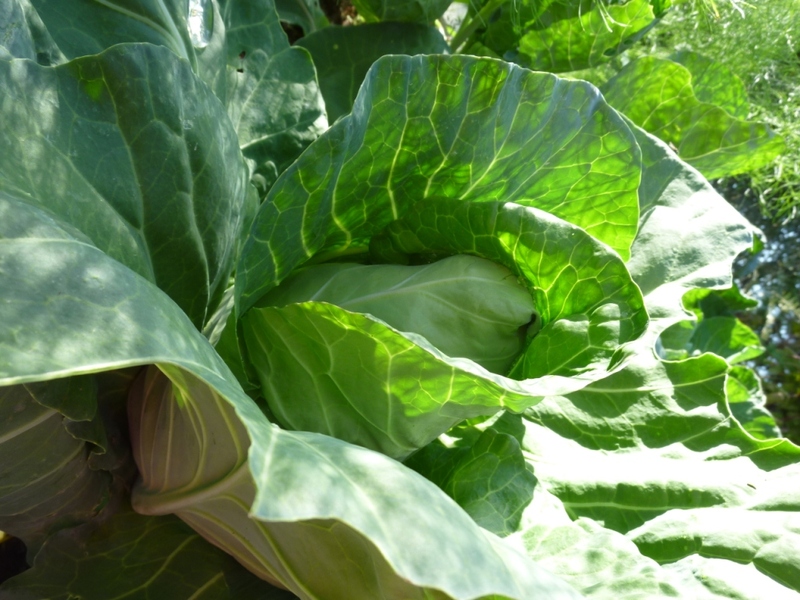 I also sowed some misticanza cut and come again lettuce – it shouldn’t be too late for them. At the end of last week I picked a huge quantity of cooking tomatoes and I’ve been picking salad, beefsteak and small tomatoes every day. Several days lunch has been Caprese salad with good homemade focchacia and maybe a few olives. The grafted San Marzano tomato hasn’t produced fruit quicker than the other ordinary plants so I wouldn’t worry to buy that again; but the peppers are certainly worth it as everyone told me I wouldn’t get any red or yellow peppers. I harvested the first 2 melanzane (aubergines) and my very first ever peppers. I cooked them by simply grilling them on the barbeque along with a couple of overgrown zucchini (courgettes) – they need to be a big larger to grill so at least there is something to do with the ones that seem to hide until there’s too big. I’ll picking roughly one cucumber per plant every day, there’s six plants so obviously I have too many! They aren’t as good to eat as last year’s, I seem to remember there’s something about male and female plants, but I don’t remember the details I need to look it up. If you have any good recipes for cucumbers I would be very grateful. 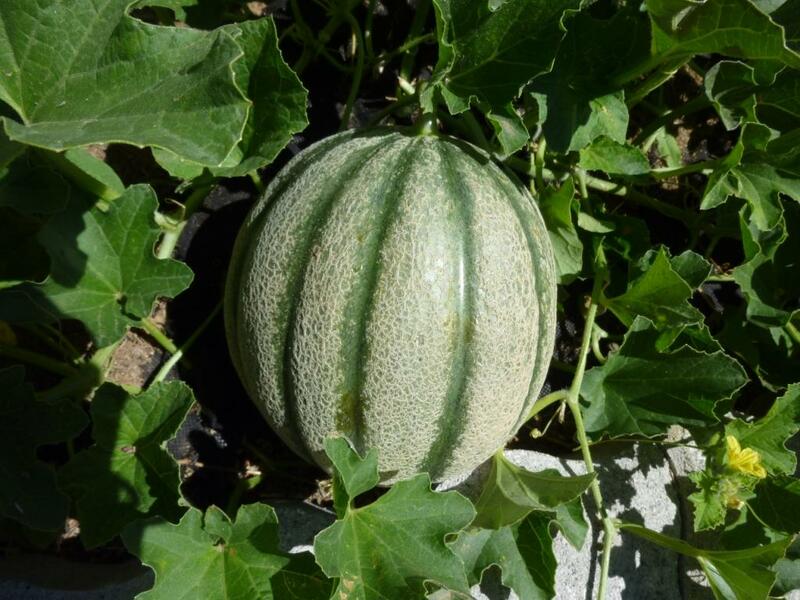 Last weekend I picked the first melon I have ever grown! We have now eaten three. I only planted 2 plants as I was sceptical that they would grow and ripen (I’m not sure why I was sceptical). They were all sweet and juicy, better still there are more to come. I have been taking off some of the side shoots so as not to put too much strain on the plant to try to produce too many fruits. Certainly next year I will plant more, they are worth all the space they take. I have been given some more tomatoes, heritage varieties grown by friends from seed. It is very late to plant them but hopefully they will at least produce some fruit to keep the varieties going. Some are San Mazzano di Messina. They have special significance to my good friend Lucia whose father brought them from Sicily and they have been grown each year from the previous year’s seed for 25 years. The fennel plants mentioned above didn’t get planted so have died in their tray. Many of the lettuces have been eaten by something but some are trying to grow. All the older ones have either been eaten or gone to seed and found their way into the compost bin. Yesterday I ate the first sweetcorn, what joy! Here in Italy maize is what is grown to feed the cows – they cannot be called sweetcorn by any stretch of the imagination as they are tough and taste of nothing, mine cane from seed purchased in England. I followed the instructions in my very old Cordon Bleu cook book which states that the corn should be picked, then carried directly to a pan of already boiling water, and cooked for just 5 minutes. I ate it with salt, pepper and a drizzle of my olive oil. All the onions are harvested now. I will grow them again but either using sets and planting in January or February or buying small plantlets and planting whenever they become available. The raspberries I thought of as being autumn fruiting but which gave a crop at the same time as the others have produced strong, long canes that are now producing beautiful berries much larger than before, too good for jam; lovely as a topping for Pavlova or serving with Pannacotta or just by themselves. 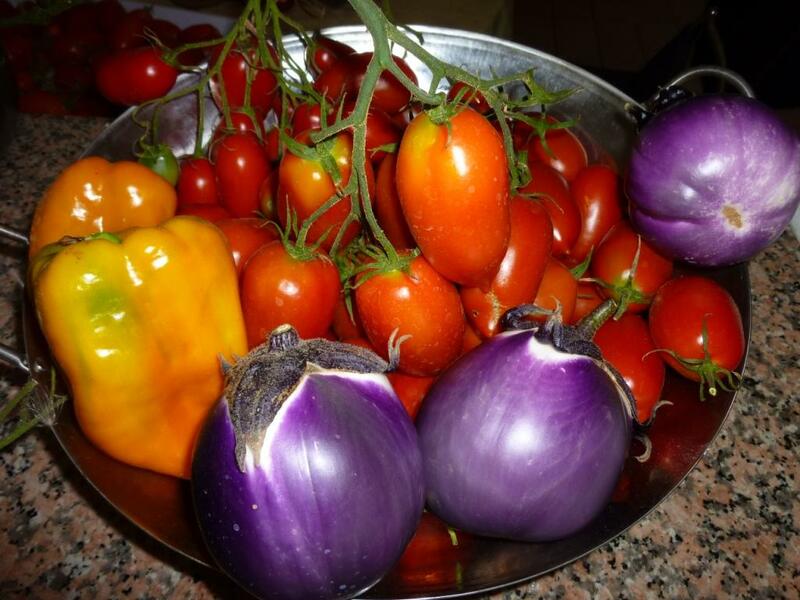 I am picking plentiful supplies of aubergines (melanzane, egg plants), red and yellow peppers and kilograms of tomatoes. All my containers were full so I used my wok! 6- 8 San Marzano; 6 beefsteak, 6 pachino, 6 Ciliegine, plus maybe a few special varieties like yellow pear-shaped, black striped etc. I picked about a dozen aubergines and some red and yellow peppers. 6 aubergine plants seem about the right number. I would like to start the peppers earlier either under cloches or in a greenhouse if I have one by then. 4 red and 2 yellow is probably enough especially if I buy the grafted ones again. 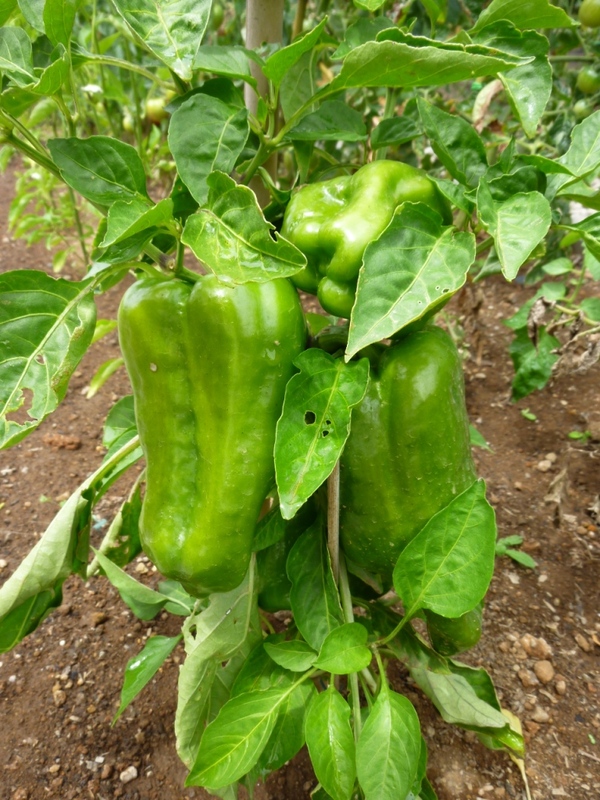 They need planting with lots of supports around them as they produce so many peppers the stems break. The tomatoes are nearly finished now, those that remain on the vines have end rot; they are less tasty now and I will probably pick those that remain in the next few days and make tomato and chilly jam and green tomato chutney. The peppers and aubergines are still producing very well as are the chillies. I must pick some green to freeze for Thai green curry paste. We’ve already eaten 2 heads of Broccoli and 2 cabbages. Both delicious, the best I’ve ever grown. They are all ready together so a glut now, then I’ll have to buy them. Interestingly I’ve had very little problems with Cabbage White caterpillars; I think this is because there are so many wasps in the garden and I have seen them on the plants eating eggs and the caterpillars before they grew. The fennel plants are just about ready so I need to eat them before there is a frost. I have Romanesco which is growing but not ready yet and leeks (they are Ok but they’re in the bed which I added some bought-in soil which unfortunately seems to have no fertility and a some fungus problems; I will have to plant the rest of the onion crop else where and leave this bed with some manure over winter if I can find some. My zucchini have almost finished producing now. I need to clear the beds of everything that’s finished and mulch ready for spring crops. I should plant some broad beans – I might be a bit late, but worth a try. For 2012 I have decided to write posts about progress and add a link here; I hope this works better than having to search through lots of posts. Interesting that you were planting french beans in june – I tried to buy plants but all gone and of course too late for seed. correction – you sowed french beans – I would have done that too if I had realised that it was not too late. Last year I think I sowed them even later and they produced a huge crop (too many to eat). I will even try a second sowing during the first week of July. They germinated in under a week! very interesting – and with all this rain they should be doing well. I will see if I can find some seed and try myself. Thank you! Your orto is doing very well. My zucchini aren’t doing as well as last year for which I’m actually quite grateful! all my tomatoes are producing now. One day I havested 5 beefsteak tomatoes that weighed about 1 kg. My beans are being slow to actually produce beans, they are planted in soil I bought in to fill some of the beds, and I don’t think it’s very fertile. My peppers are now red and ready to harvest and I expect to pick the first melanzane this weekend. The raspberries continue, but I’m picking only every 2 days now. Please post some more photos of your orto and I’ll do the same. A very formal layout you have there, my veggie beds at my allotment aren’t that formal, I hope you have a good and productive season this year!! Again..this garden area is so well planned! I just love it! What are your veg. beds created from? I have to redesign mine – yours are gorgeous. I’ve tried to find a quite corner, in your understandably well visited website, just to say how amazing your garden looks … all credit to you. What an achievement. I love the layout of your vegetable garden. How big is it in total? It looks lovely!